Catered Private hotel-standard rooms Dec-Apr 4 or more days Frozen lakes, forest. Lapland, northern Sweden Dog sledding, snowmobiling, snowshoeing, cross country skiing, sauna, wellness, Ice Hotel visit, good possibilities for Northern Lights. Catered Private 2-4 person chalets Dec-Apr 8 days/7 nights Frozen lakes, forest. 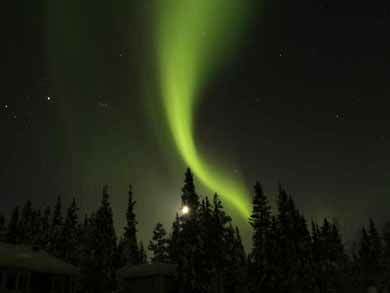 Lapland, northern Sweden Snowshoeing, dog sledding, cross country skiing (including overnight tour), Sami culture, wildlife presentations, good possibilities for Northern Lights. Catered Fully-equipped log cabins Dec-Mar 4 or more days Forest, lakes, rolling hills Cross country skiing, snowshoeing, snowmobiling, ice fishing, tobogganing, sauna, downhill skiing (at local resort within driving distance), dog sledding (short tours). Winter is a marvellous season in the Nordic countries, and one of our Winter Active Accommodation experiences can provide the perfect blend of comfort, relaxation and activity, whether you choose a catered or self-catered option. Aurora Lodge Escape in Lapland combines comfortable, hotel-standard accommodation with a wide variety of optional activities, from snowshoeing and cross country skiing to dog sledding and snowmobiling. This can be chosen as a stand-alone experience or, if you are spending longer in the area, makes an ideal combination with one of our longer dogsled tours in the Kiruna region such as Northern Lights Dog Sledding in Lapland. The Lodge offers a comfortable, relaxed atmosphere with sauna available each night and a focus on local cuisine and is a very good choice for couples or for families with older children looking for a multi-activity winter experience with the chance to try a number of activities from a fixed base. Also in the far north of Sweden, right on the Finnish border, Winter Activity Adventure in Lapland offers a week's programme of winter experiences including snowshoeing, dog sledding and overnight ski tour to wilderness cabin, with accommodation in simple but comfortable chalets for 2-4 persons and meals served in the camp restaurant. The Aurora Lodge Escape, Reindeer Lodge and Winter Activity Adventure in Lapland experiences are all located in areas giving very good chances to see the Northern Lights during your stay. The Northern Lights can be seen up until around early/mid-April, after which the nights become too light. Moving further south in Sweden, Winter Wonderland on a Forest Farm is just 2.5 hours north of Stockholm and is particularly suitable for families with children of all ages, including young children. There are just two rooms at the farm and your local hosts, who have a wealth of knowledge about the forest and its secrets, create a very personal and welcoming atmosphere. Food is all home-made and prepared from organic and locally-produced or foraged ingredients, and as a very personal experience, a stay at the Forest Farm can also be very flexible. It is particularly popular for stays during Christmas, New Year and the February Half Term. In a normal year, there is usually snow at the farm before Christmas, with the main winter season being January to March. 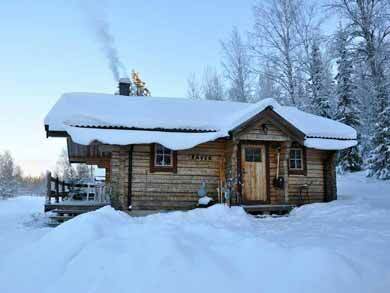 With a similar winter season to the Forest Farm, Winter Log Cabin Escape in Värmland lies in the west of Sweden, roughly level with Stockholm and towards the Norwegian border, and offers a wonderful location for a self-catering winter holiday. 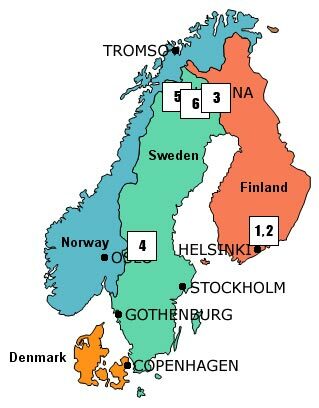 Again, the main winter season is typically January-March, with snow before Christmas in a typical season. With three cabins located approx. 25m apart each sleeping up to 4 adults (or a family of 5 with children), this experience makes a good choice for two or more families or groups of friends travelling together, as well of course if travelling as just one family or couple. Possible activities include snowshoeing, tobogganing and cross country skiing in the surrounding forests, as well as snowmobiling and dog sledding day tours. Guided ice fishing and fishing equipment hire can also be arranged. To fully explore the range of possibilities and attractions in the area (including possibilities for downhill skiing), a car will be required, but the experience is also accesssible by public transport. In Finland, we offer two options for active winter getaways, both in the Päijänne Tavastia area just two hours from Helsinki. Choose between our cosy Romantic Winter Cabin with Sauna in Päijänne Tavastia, which accommodates 2-3 persons, or the beautiful, traditionally-crafted Taina and Vesa cabins of Winter Log Cabin Getaway in Päijänne Tavastia, sleeping 2-8 persons. Each cabin has its own wood-heated sauna and winter activities include cross country skiing, snowshoeing, natural ice skating, kicksledding and ice fishing, with all necessary equipment available to hire and cross-country skiing instruction also available. Winter in the Nordic countries is a magical time, and our range of accommodation options provide an ideal opportunity to experience a winter holiday adventure from a comfortable base and with the freedom to make your trip as active or relaxing as you wish!